Background and aims: There is now good evidence from several sources that hypnotherapy can relieve the symptoms of irritable bowel syndrome in the short term. However, there is no long term data on its benefits and this information is essential before the technique can be widely recommended. This study aimed to answer this question. Patients and methods: 204 patients prospectively completed questionnaires scoring symptoms, quality of life, anxiety, and depression before, immediately after, and up to six years following hypnotherapy. All subjects also subjectively assessed the effects of hypnotherapy retrospectively in order to define their “responder status”. Results: 71% of patients initially responded to therapy. Of these, 81% maintained their improvement over time while the majority of the remaining 19% claimed that deterioration of symptoms had only been slight. With respect to symptom scores, all items at follow up were significantly improved on pre-hypnotherapy levels (p<0.001) and showed little change from post-hypnotherapy values. There were no significant differences in the symptom scores between patients assessed at 1, 2, 3, 4, or 5+ years following treatment. Quality of life and anxiety or depression scores were similarly still significantly improved at follow up (p<0.001) but did show some deterioration. Patients also reported a reduction in consultation rates and medication use following the completion of hypnotherapy. Conclusion: This study demonstrates that the beneficial effects of hypnotherapy appear to last at least five years. Thus it is a viable therapeutic option for the treatment of irritable bowel syndrome. Gut directed hypnotherapy comprises a course of up to 12 weekly 1 hr sessions.7,13 Each session consists of induction of the hypnotic state and deepening procedures, followed by “ego strengthening” suggestions relevant to the individual. These are accompanied by further suggestions and interventions, such as inducing warmth in the abdomen using the hands and imagery, directed towards controlling and normalising gut function. This work led to the establishment of the first hypnotherapy unit in the National Health Service in the UK devoted to the treatment of IBS patients. We have recently published an audit on the first 250 patients treated at this unit,13 confirming the beneficial effects of hypnotherapy in a large number of patients. However, outcome was measured immediately after patients completed the course of hypnotherapy. The aim of this present study, therefore, was to establish follow up on a large number of patients treated, to determine the longer term effects of therapy, in terms of symptom improvement, consultation rates, and use of medication. A subjective assessment questionnaire (SAQ), rating the effects of hypnotherapy on symptoms, consultation rates, and use of medication through Likert-type responses, and other information, for example, continued practice of HT techniques (Appendix 2). 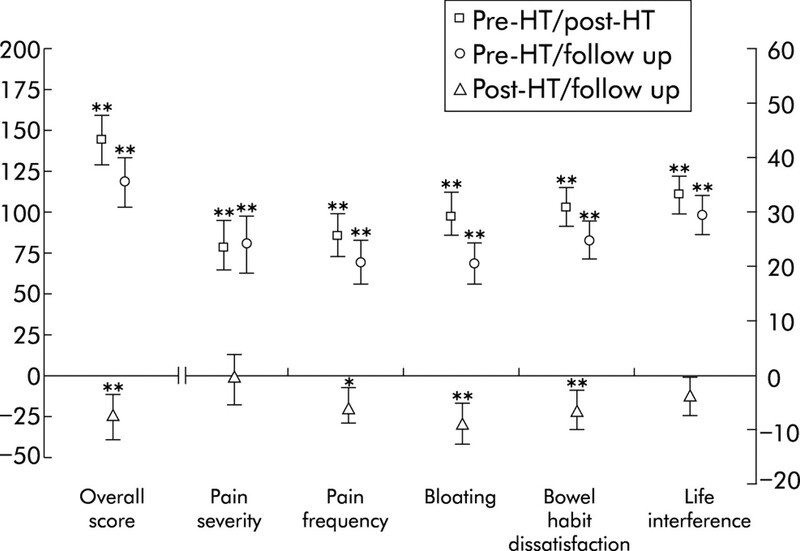 All patients had already completed the IBS Questionnaire and HAD Scale both immediately before and after the course of HT, and therefore data were available for three different time points—that is, pre-HT, post-HT, and follow up. Mean values (with SEM) were calculated for all scores in the IBS questionnaire and HAD Scale completed pre- and post-HT and at follow up. Intra-individual differences in scores between these time points, with positive and negative values denoting improvement or deterioration in scores, respectively, relative to the earlier time point, were compared by paired t test. Comparison between individual groups was performed using independent t test (two groups) or analysis of variance (more than two groups). For each item in the SAQ, data are given as the proportion (%) of patients rating each response category. Intra-individual comparisons were made using McNemar’s test and independent groups compared using χ2 test. Spearman (ρ) correlation coefficients were calculated to assess relationships between variables. For further analysis, patients were subdivided into responders and non-responders, based on the response to SAQ(i), with responders defined as patients rating their symptoms either “very much better” or “moderately better” at the end of the course of HT and non-responders as those rating symptoms “slightly better” or less. Patients were also grouped according to the number of years that had lapsed since completing treatment. Binary logistic regression analysis was performed to identify factors affecting “responder” status. In order to limit the number of variables examined at any one time, a stepwise analysis was carried out using a series of variable blocks, with blocks relating to pre-HT measures for all symptoms, quality of life, and HAD scores as well as age, gender, and bowel habit. Overall scores for IBS symptoms and extra-colonic features were treated as the primary outcomes. For the purpose of comparing secondary endpoints—that is, the individual measures making up these overall scores—only differences at the 0.1% (p<0.001) were interpreted as showing reasonable evidence of a true difference, instead of adjusting for multiple comparisons. Of the 273 questionnaires 204 were returned, representing a 75% return rate. These were reasonably equally distributed according to the time since completing treatment (1<2 years ago: 22.4%; 2<3 years: 18.4%; 3<4 years: 27.8%; 4<5 years: 21.4%; ⩾5: 10.0%). There were 106 (52.0%) patients who reported their symptoms as “very much better” at the end of the course of HT, 39 (19.1%) as “moderately better”, 32 (15.7%) as “slightly better”, while 27 (13.2%) reported no change in symptoms. No patients reported worsening of symptoms. Patients in whom symptoms were very much or moderately better (71.1% of total) were then defined as “responders”, and those with only slight improvement or no change as “non-responders”. Subdividing according to responder status as above, 81.3% of responders maintained the improvement gained, with the majority stating that their symptoms had improved even further (29.2% improved “much more”, 24.3% “moderately more”, 11.1% “slightly more”, and 16.7% “about the same as at the end of HT”). The remaining 18.7% had experienced mostly slight deterioration in symptoms. More responders than non-responders stated that symptoms had continued to improve after finishing HT (responders (R) v non-responders (NR): 64.6% v 35.0%, χ2=13.54, p<0.001) and symptom improvement was mainly rated as slight for these non-responders. The majority of non-responders, therefore, had no improvement in symptoms during the follow up period, with 49.1% being about the same as at the end of treatment (that is, about the same or only slightly improved compared with before HT) and 15.8% slightly worse. Scores from pre- and post-HT IBS questionnaires were compared in patients returning and not returning follow up questionnaires, in order to ensure that those returning these questionnaires were representative of the patient group as a whole. No differences in symptom severity before treatment or in initial improvement after HT emerged. Questionnaires returned (n=204) v not returned (n=69): pre-HT (mean, SEM): pain severity 56.1 (1.9) v 60.1 (2.6); pain frequency 55.0 (2.4) v 64.1 (3.3); bloating 61.0 (1.9) v 61.8 (2.9); bowel habit dissatisfaction 71.6 (1.8) v 73.0 (2.4); life interference 72.5 (1.4) v 75.1 (1.7); overall score 314.2 (6.1) v 330.4 (8.6), all p>0.05. Pre-HT/post-HT intra-individual differences (mean, 95% confidence interval (CI)): pain severity 25.5 (21.5 to 29.5) v 27.2 (22.0 to 32.4); pain frequency 23.8 (19.1 to 28.6) v 35.3 (28.5 to 42.1); bloating 29.4 (25.5 to 33.4) v 31.9 (26.7 to 37.2); life interference 33.2 (29.4 to 36.9) v 31.1 (25.7 to 36.6); overall score 144.1 (128.8 to 159.4) v 151.3 (129.2 to 173.5), all p>0.05, except pain frequency where p=0.005. Intra-individual differences in scores between the three different time points (that is, pre-HT, post-HT, and follow up) in the 204 patients for whom follow up data were obtained (figure 1) showed that all symptoms as well as the overall score had improved immediately after HT and remained better at follow up (pre-HT/post-HT and pre-HT/follow up intra-individual differences, all p<0.001). Symptoms had increased slightly at follow up compared with post-HT levels but this was significant only for bloating and bowel habit dissatisfaction (post-HT/follow up intra-individual differences, both p<0.001). Intra-individual differences in IBS symptom scores for all patients (n=204) between the different time points—that is, pre-HT post-HT, pre-HT/follow up, and post-HT/follow up. Data expressed as mean (95% confidence interval (CI)), with positive and negative values denoting reduction (improvement) and increase (deterioration) in score relative to earlier time point. (Mean values of scores at these time points are given in the text.) Overall score treated as the primary outcome and therefore no adjustment is made for multiple comparisons. “Unadjusted” comparisons for individual symptoms significant at the 0.1% level are assumed significant at the 5% level if multiple comparison adjustment is made. *p<0.01, **p<0.001. Patients’ rating of improvement in the SAQ was reflected in the IBS questionnaire scores with a direct correlation, firstly, between rating of improvement after HT, SAQ(i), and intra-individual differences in pre-HT/post-HT overall IBS scores (ρ=0.433, p<0.001), and, secondly, between rating of symptom progress since completing HT, SAQ(ii), and differences in post-HT/follow up overall IBS scores (ρ=0.488, p<0.001). As shown in table 1, severity of IBS symptoms prior to HT was no different between the responders and non-responders (R v NR: all p>0.05). However, mean scores for responders were significantly lower than those for non-responders both immediately after HT (all p<0.001) and at follow up (all p<0.001, except pain severity (p<0.5) and bloating (p<0.01). 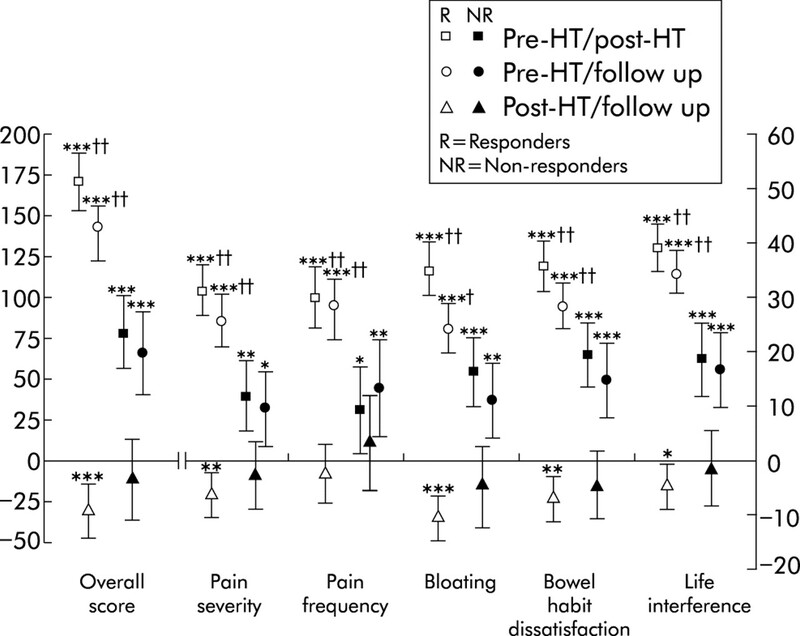 Intra-individual differences in scores between the different time points (figure 2) shows that while some symptom measures were also significantly improved in the non-responder group post-HT and at follow up (bowel habit dissatisfaction and life interference p<0.001 at both time points), these changes were small compared with those in responders. Indeed, responders had greater reduction in symptom scores than non-responders both immediately after HT (pre-HT/post-HT intra-individual differences, R v NR: all p<0.001) and at follow up (pre-HT/follow up intra-individual differences, R v NR: all p<0.001 except pain frequency, p<0.005). Furthermore, no significant intra-individual differences between post-HT and follow up symptom scores occurred for non-responders (all p>0.05), showing that symptoms did not improve with the course of time. Intra-individual differences in IBS symptom scores for responders and non-responders between the different time points shown. Data expressed as mean (95% confidence interval (CI)), with positive and negative values denoting reduction and increase in score relative to earlier time point. (Mean values of scores at these time points are given in table 1.) Overall score treated as the primary outcome and therefore no adjustment is made for multiple comparisons. “Unadjusted” comparison for individual symptoms significant at the 0.1% level are assumed to be significant at the 5% level if multiple comparison adjustment made. *p<0.05, **p<0.01, ***p<0.001 (intra-individual difference); † p<0.005, †† p<0.001 (responders v non-responders). There was no association between the time, in years, since responders had completed treatment and intra-individual differences in post-HT and follow up overall IBS score (ρ=−0.027, p=0.752), suggesting that those with a longer gap since treatment had maintained improvement just as well as those who had finished more recently. In addition, there were no marked differences in overall IBS scores (table 2) between the different time intervals either before HT (p=0.310) or at follow up (p=0.458) or in the pre-HT/follow up intra-individual differences in this score (p=0.781). Severity of extra-colonic symptoms before HT was similar for both responders and non-responders (table 3). Responders had significant improvement in individual symptoms and overall score after HT (pre-HT/post-HT intra-individual differences, all p<0.001) and most of these remained better than pre-HT levels at follow up (pre-HT/follow up intra-individual differences all p<0.001, except urinary symptoms, thigh pain, and bodily aches, p<0.05). Although non-responders had significant improvement in overall extra-colonic score and some individual symptoms immediately after HT (pre-HT/post-HT intra-individual differences: overall score, nausea, excess wind, lethargy all p<0.001), this had deteriorated at follow up. Responders had more pronounced improvement in overall score than non-responders, both post-HT and at follow up (intra-individual differences, R v NR: pre-HT/post-HT p<0.001; pre-HT/follow up: p<0.005) and for a number of individual symptoms after HT, including excess wind (pre-HT/follow up intra-individual differences, R v NR: p<0.001), lethargy, backache, and heartburn (all p<0.005), although this was not evident at follow up (intra-individual pre-HT/follow up differences, R v NR: excess wind, lethargy, backache all p<0.05; heartburn p>0.05). Quality of life measures before HT were no different for responders and non-responders (table 4). Although there was some improvement in the non-responder group immediately after HT (pre-HT/post-HT intra-individual differences, all p<0.005, physical well being and control p<0.001), this was significant at follow up only for mood (p<0.005). Improvement occurred in responders both after HT and at follow up compared with pre-HT levels (intra-individual differences: pre-HT/post-HT all p<0.001; pre-HT/follow up all p<0.001, social/relationships p<0.005) and this was more marked than in non-responders, particularly for psychic and physical well being (R v NR: pre-HT/post-HT p<0.001; pre-HT/follow up p<0.01). HAD scores for anxiety and depression were similar in both patient groups before HT (R v NR: HAD “A” anxiety (mean (SEM)): 10.7 (0.4) v 9.8 (0.6), p=0.184; HAD “D” depression: 6.7 (0.3) v 6.8 (0.4), p=0.798). Scores had improved in both groups post-HT and were still better than pre-HT levels at follow up (intra-individual differences (mean (95%CI)): pre-HT/post-HT: anxiety, R: 4.1 (3.5 to 4.7), NR: 2.4 (1.4 to 3.3); depression, R: 3.4 (2.8 to 4.0), NR: 1.7 (0.9 to 2.6), all p<0.001; pre-HT/follow up: anxiety, R: 2.7 (2.0 to 3.3), p<0.001; NR: 1.5 (0.5 to 2.5), p=0.003; depression, R: 2.5 (1.9 to 3.2), NR: 1.4 (0.7 to 2.2), both p<0.001). Improvement was overall greater in the responder group, particularly post-HT (R v NR: anxiety and depression, both p=0.002) but less evident at follow up (R v NR: anxiety: p=0.068; depression, p=0.031). Fewer responders were significantly anxious or depressed (HAD scores >9) after HT and at follow up, while fewer non-responders were anxious post-HT only (HAD “A” >9 (anxious): Pre-HT v post-HT: R: 59.0% v 24.4%, p<0.001; NR: 48.3% v 28.1%, p=0.008; versus follow up: R: 31.9%, p<0.001; NR: v 37.3%, p=0.210; HAD “D” >9 (depressed): Pre-HT v post-HT: R: 20.7% v 5.5%, p<0.001; NR: 18.6% v 11.9%, p=0.424; versus follow up: R: 9.0%, p=0.002; NR: 13.6%, p=0.549, McNemar’s test). The majority of responders compared with around half of non-responders stated they had seen their GP and the hospital consultant less often about IBS symptoms since HT, and more responders had seen their GP less often about other symptoms (consulted “less often”, “about same”, “more often”: R v NR (%): GP/IBS symptoms: 87.9%, 10.7%, 1.4% v 50.9%, 45.6%, 3.5%, χ2=31.75, p<0.001; Consultant/IBS symptoms: 83.3%, 13.7%, 3.7% v 54.8%, 40.5%, 4.8%, χ2=13.41, p=0.001; GP/other symptoms: 61.2%, 32.6%, 6.2% v 21.8%, 63.6%, 14.5%, χ2=24.10, p<0.001). Medication taken before HT included antispasmodics (42.0% of all patients on medication), antidiarrhoeals (23.2%), laxatives (12.3%), bulking agents (9.4%), antidepressants (21.0%), and anxiolytics (10.9%), with 27.5% taking at least two types of medication. A similar proportion of responders and non-responders were taking medication before HT but fewer responders were on medication during follow up (R v NR: Pre-HT: 67.6% v 67.8%, χ2=0.03, p=0.856; during follow up: 36.6% v 55.9%, χ2=6.27, p=0.012). Of those patients continuing to take medication, more responders stated they had taken it less often than before (“less often”, “about same”, “more often”, R v NR: 62.3%, 26.4%, 11.3% v 9.1%, 69.7%, 21.2%, χ2=23.91, p<0.001). While proportionately more non-responders than responders with low anxiety and depression scores (HAD scores <10) at follow up were taking antidepressants and/or anxiolytics (NR v R: 21.1% v 6.0%, p<0.001) these represented only a minority of non-responders with low scores, since 63% and 80% of this group had low HAD “A” and “D” scores, respectively. There were no differences between responders and non-responders in any baseline measures of symptoms, quality of life, or HAD scores (tables 1, 3, and 4 and HAD results section) but more males than females were non-responders (males v females: R: 57.5% v 74.7%; NR: 42.5% v 25.3%, χ2=4.63, p=0.031). Although more males had diarrhoea predominant bowel habit (males v females, bowel habit type: constipation 12.8% v 25.5%, diarrhoea 51.3% v 24.8%, alternating 35.9% v 49.7%, χ2=10.77, p=0.005), no more non-responders were found with this or any other bowel habit type, either for patients as a whole or for males (constipation v diarrhoea v alternating: all patients, R: 69.6% v 73.3% v 71.3%; NR 30.4% v 26.7% v 28.7%, χ2=0.19, p=0.911; males: R: 40.0% v 60.0% v 57.1%; NR: 60.0% v 40.0% v 42.9%, χ2=0.66, p=0.721). Non-responders were also overall slightly older than responders (mean age (SEM), years: R v NR: 45.1 (1.2) v 50.3 (1.8), p=0.017). However, binary logistic regression analysis identified only gender as having a significant relationship with responder status (OR (95% CI): 0.30 (0.16 to 0.97), p=0.042). More responders than non-responders continued to practise HT techniques after treatment (R (% patients): 85% v 58%, p<0.001), although both groups had a similar pattern of practice (R v NR: with tape only: 38.7% v 36.4%; without tape: 42.4% v 42.5%; both with/without tape: 18.9% v 21.1%; χ2=0.24, p=0.970). There was no difference in symptom change during follow up between patients who still practised and those who did not (intra-individual difference in post-HT/follow up overall IBS score (mean (SEM)), practice v no practice: all patients: −19.5 (16.6) v−27.4 (7.8), p=0.392; R only: −24.8 (32.6) v−31.9 (8.7), p=0.628). Similarly, there was no correlation between symptom change and frequency of practice (all patients: ρ=0.027, p=0.777; R only: ρ=0.067, p=0.572). The continued improvement seen in responders cannot be explained by the use of other treatments after finishing HT. Only 14 (9.7%) of responders had tried other treatments, including dietary changes, alternative medicines, yoga, and reflexology and found these helpful. Of all patients, 93.1% considered that the course of HT had been worthwhile, which included all of the responders and 76.3% of non-responders. This study presents the first long term follow up of a large number of patients who have undergone hypnotherapy for IBS symptoms. Immediately after HT, 71% of patients considered their symptoms very much or moderately better and these patients were defined as “responders”. Of these initial responders, 81% maintained the benefit of treatment or reported further improvement. In contrast, non-responders, with only slight or no improvement in symptoms with HT, had little or no change in symptoms over the follow up period. There was a good correlation between the SAQ ratings and the objective symptom scores. IBS symptom scores were significantly improved after HT and remained so at follow up, with only a slight deterioration compared with post-HT levels. The beneficial effects did not appear to decline with time since patients who had finished treatment more than five years ago maintained symptom improvement just as well as those who had completed only a year ago. Similarly, extra-colonic features, quality of life, anxiety, and depression scores were still better at follow up compared with pre-HT levels. Interestingly, all patients reported taking less medication and had consulted less often for IBS and other symptoms, but this was particularly striking for the responder group. The subdivision of patients into “responders” and “non-responders”, based on the SAQ rating of symptom change, was undertaken in order to concur with the current practice of using a subjective global assessment as a primary outcome in clinical trials in functional bowel disorders.16 It also facilitated further analysis of the data, and indeed revealed that there were clear differences between responders and non-responders in terms of IBS and other symptom scores, consultation rates, and use of medication after treatment. The SAQ was only completed at follow up, hence requiring patients to assess the effects of HT retrospectively and therefore the reliability of their reports could be called into question. However, the fact that the SAQ correlated with changes in symptom rating from the IBS questionnaires would indicate that the SAQ assessments are a reliable reflection of treatment outcome. Similarly, patients’ reports of consultation rates and use of medication must be interpreted with some caution. However, one could determine the number of patients who had stopped medication after HT, since medication was recorded at the start of HT and at follow up. Reports in terms of fewer consultations and less medication were markedly different between responders and non-responders, suggesting that these cannot be explained entirely by recall bias. Very little deterioration occurred in IBS symptoms over time, although some of the other measures, such as certain extra-colonic symptoms, quality of life, and scores for anxiety and depression, did show some attrition, but most of these were still better at follow up than before treatment. Quality of life and psychological well being are influenced by many other factors such as life events, irrespective of gastrointestinal problems and it is possible that any of these could have been operating within an individual since treatment, thus contributing to the change in these scores. Anxiety and depression scores were significantly lower both post-HT and at follow up in both responders and non-responders, although the proportion of patients who could be classified as significantly anxious or depressed was only lower in responders. This would suggest that even though non-responders did not improve in terms of IBS symptoms, they did derive some benefit psychologically. This is unlikely to be an effect of taking anxiolytics or antidepressants, since only a relatively small proportion of these non-responders were taking such medication after treatment. It is also interesting to note that nearly all patients considered the hypnotherapy to have been worthwhile, so that even non-responders felt that they had benefited in some way even though their symptoms had not altered with treatment. Maintained improvement of symptoms did not appear to have any association with whether or not or how often responders continued to practise hypnotherapeutic techniques following treatment, although only 15% of responders discontinued practice. The reason for this somewhat unexpected finding is not readily apparent and does raise the question whether continued practice is necessary for any particular individual to maintain benefit. It may suggest that those who did well with HT yet did not continue to practise overtly have developed the ability to continue using their hypnotic skills at a subconscious level. In conclusion, this study confirms that the beneficial effects of HT are long lasting, with continued improvement in symptoms, thus giving patients better control over their condition, although it may be less useful for male patients. A potential criticism for the use of hypnotherapy as a treatment for IBS has been that it is costly to provide because of the demands on therapists’ time. However, because of its sustained effects in the majority of patients, costs of treatment could be rapidly offset by the ensuing reduction in cost of medication and other healthcare demands. The value of each quality of life measure was derived from the mean of the individual items shown indicated in parentheses, to give a maximum score of 100. Social/relationship (relationships with family/partner, ability to maintain friendships, inferiority, feeling wanted, enjoyment of leisure). This is a simple questionnaire devised in the Unit asking patients to rate the effects of HT on symptoms, consultation rates and use of medication etc, using Likert-type responses, as shown below. Compared with how you felt before HT, how would you rate your symptoms were at the end of the course of HT? gone: slightly worse, moderately worse, much worse. more often, about the same, less often (than before). We wish to thank the other staff of the Hypnotherapy Unit who treated some of the patients used in this study: Mrs P Cooper, Mrs P Cruickshanks, Mrs J Randles, and Mrs V Whelan. We also thank Mrs Julie Morris, Head of Medical Statistics, University Hospital of South Manchester, for help with statistical analysis. Whorwell PJ, McCallum M, Creed FH, et al. Non-colonic features of irritable bowel syndrome. Gut1986;27:37–40. Switz DM. What the gastroenterologist does all day. A survey of a state society’s practice. Gastroenterology1976;70:1048–50. Harvey RF, Salih SY, Read AE. Organic and functional disorders in 2000 gastroenterology outpatients. Lancet1983;i:632–4. Drossman DA, Li Z, Andruzzi E, et al. U.S. householder survey of functional gastrointestinal disorders: prevalence, sociodemography and health impact. Dig Dis Sci1993;38:1569–80. Maxton DG, Whorwell PJ. Use of medical resources and attitudes to health care of patients with ‘chronic abdominal pain’. Br J Med Econ1992;2:75–9. Talley NJ, Gabriel SE, Harmsen WS, et al. Medical costs in community subjects with irritable bowel syndrome. Gastroenterology1995;109:1736–41. Whorwell PJ, Prior A, Faragher EB. Controlled trial of hypnotherapy in the treatment of severe refractory irritable bowel syndrome. Lancet1984;ii:1232–4. Whorwell PJ, Prior A, Colgan SM. Hypnotherapy in severe irritable bowel syndrome: further experience. Gut1987;28:423–5. Houghton LA, Heyman DJ, Whorwell PJ. Symptomatology, quality of life and economic features of irritable bowel syndrome—the effect of hypnotherapy. Aliment Pharmacol Ther1996;10:91–5. Harvey R, Hinton RA, Gunary RM, et al. Individual and group hypnotherapy in the treatment of refractory irritable bowel syndrome. Lancet1989;i:424–5. Galovski TE, Blanchard EB. The treatment of irritable bowel syndrome with hypnotherapy. Appl Psychophysiol Biofeedback1998;23:219–32. Palsson OS, Turner MJ, Johnson DA, et al. Hypnosis treatment for severe irritable bowel syndrome—investigation of mechanisms and effects on symptoms. Dig Dis Sci2002;47:2605–14. Gonsalkorale WM, Houghton LA, Whorwell PJ. Hypnotherapy in irritable bowel syndrome: a large-scale audit of a clinical service with examination of factors influencing responsiveness. Am J Gastroenterol2002;97:954–61. Francis CY, Morris J, Whorwell PJ. The irritable bowel severity scoring system: a simple method of monitoring irritable bowel syndrome and its progress. Aliment Pharmacol Ther1997;11:395–402. Zigmond AS, Snaith RP. The Hospital Anxiety and Depression scale. Acta Psychiatr Scand1983;67:361–70. Veldhuzen van Zanten S, Talley N, Bytzer P, et al. Design of treatment trials for functional bowel disorders. Gut1999;45:1169–77. Spiller RC. Problems and challenges in the design of irritable bowel syndrome clinical trials: experience from published trials. Am J Med1999;107:91–7S.